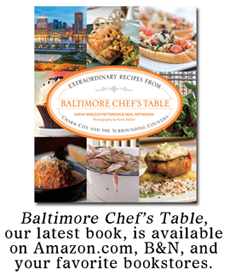 I had heard from several sources that Clementine was "awesome," so I was happy to see that the restaurant was not only participating in Dining Out for Life, but it was also one of the handful that were offering 50% of the night's proceeds to Movable Feast. Couldn't be a more perfect reason to check it out. Clementine, located on Harford Road in Hamilton, is an entirely charming restaurant. The decor is rustic, with sturdy wooden tables and chairs, window lamps made from colanders, and a hodgepodge of art-for-sale decorating the walls in the original dining room. The music playing that evening was country with a Texas twang. And our waitress was an absolute doll. The eclectic beer and cocktail menu took longer to peruse than the food menu. Eventually I settled on a Tokyo Iced Tea - a mild-tasting but potentially lethal concoction containing mint tea and sake, among other things. Mr Minx had a draft Chimay, which honestly was pretty dull for a Belgian beer that cost nearly $8. As for food, we knew we wanted to try both charcuterie plates - meat and seafood. The meat version held a slab of Danish fontina, a chubby sausage of Duroc pork seasoned with black mustard seed, fennel, and pear liqueur, a blob of chicken liver paté with thyme, rye whiskey, and honey, and a pile of house-made bread & butter pickles. The paté didn't look like much, but boy howdy was it good! (And they sell it by the pound!) The whiskey and honey lent a subtle sweetness to the chicken livers, which were smooth and rich and simply wonderful. The juicy pork sausage was similarly edged with sweetness. The cheese was fine, but I would have preferred more meaty goodness. 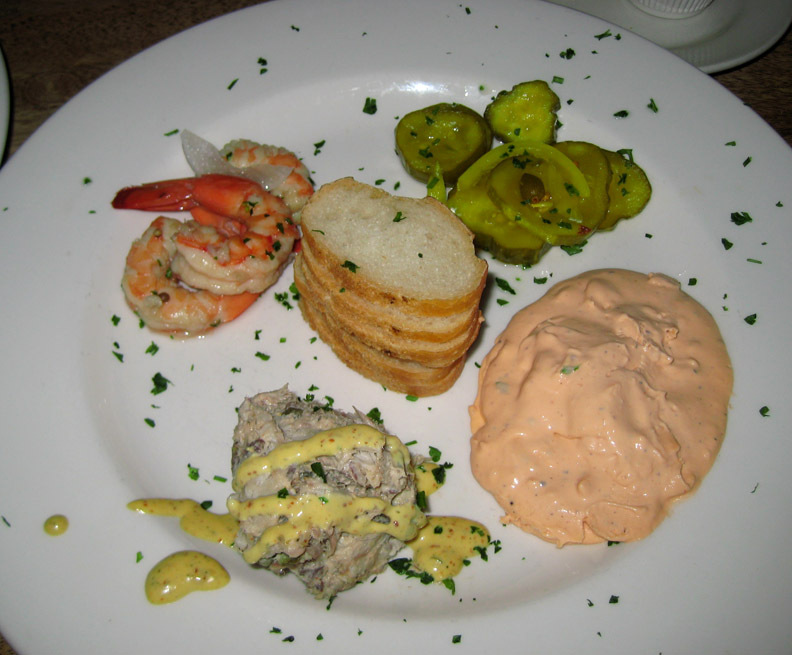 The seafood plate included pickled shrimp, smoked trout salad with remoulade, and a shrimp paté, along with more pickles. I adore smoked trout, which is what sold the dish. Trout isn't as oily as its cousin salmon, and I find that smoking it provides a more gentle flavor. This salad was lemony perfection. I expected the shrimp to be more, well, pickle-y, but was instead pleasantly surprised by an intense citrus flavor. And while I wasn't crazy about the runny texture of the shrimp paté, the nuggets of crustacean had a nice iodine quality. The bread & butter pickles were a nice tangy counterpoint to the rich items of the meat plate, but were unnecessary on the seafood version. But really, the only thing I would change is the bread. Charcuterie this good needs something with a bit more character and better crust. And maybe cut into less-dainty slices. 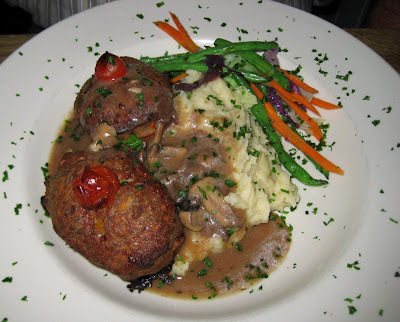 Mr Minx, feeling somewhat meat-and-potatoes deprived recently, found the description of meatloaf with smoked gouda mashed potatoes and a red eye mushroom gravy enticing. Apparently not only to read: he devoured the whole thing, citing the herbal quality of the meat as one of its best qualities. For me, however, there was probably a bit too much thyme. Loved the super-creamy mash and the homey gravy, though. 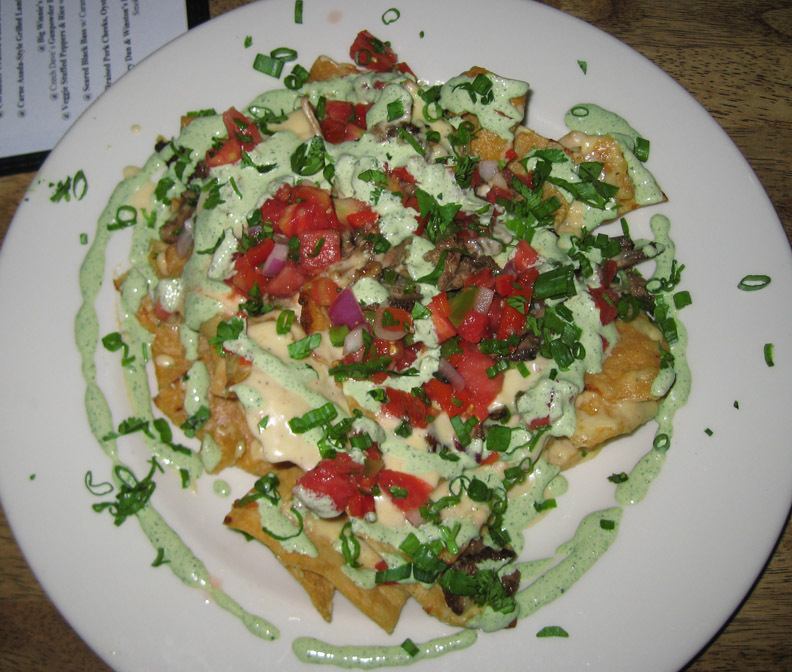 The portion was huge, btw, definitely share-able if ordered as an appetizer. For sure they don't skimp on portions at Clementine, as our desserts (made by the owner's mom) were oversized as well. 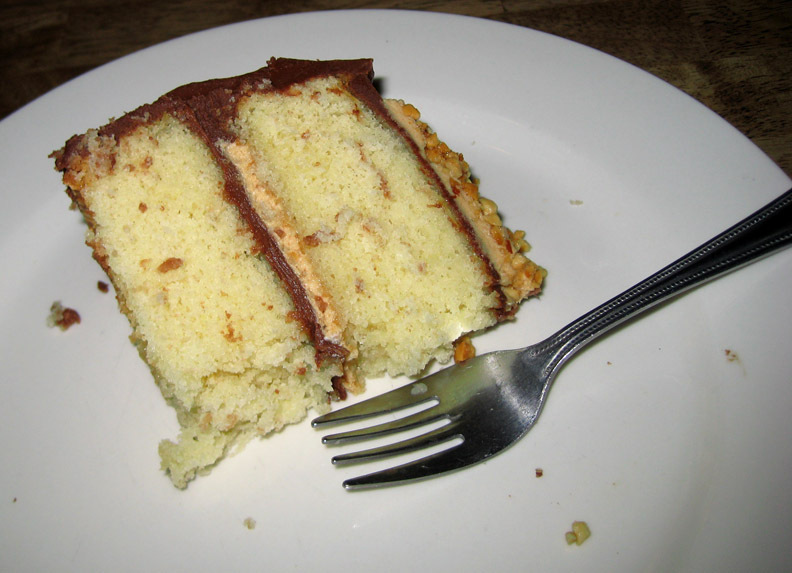 Mr Minx's yellow cake with chocolate frosting and peanut butter filling was like a home-made version of one of the treats of our youth: a Tastykake Peanut Butter Kandy Kake. But ten times better, of course. If I'm going to eat cake, 9 times out of 10 it's going to be chocolate, but a big white cake with a halo of grated coconut called to me from its very visible spot in the pastry case. 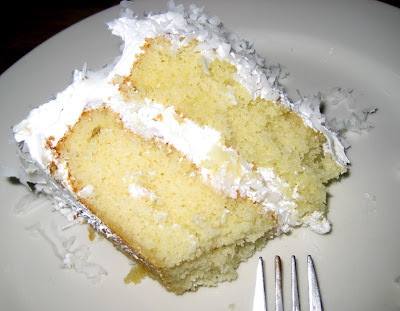 It was possibly the best yellow cake I have ever eaten - moist and somewhat dense, with fluffy seven-minute frosting and the perfect amount of coconut. I ate as much of it as I could before I had to admit defeat and a full tummy. In conclusion: we enjoyed everything immensely. I'd go back again for all of it, especially the charcuterie and cake. And that cilantro cream. I'm thinking that Clementine might just become one of our regular haunts. 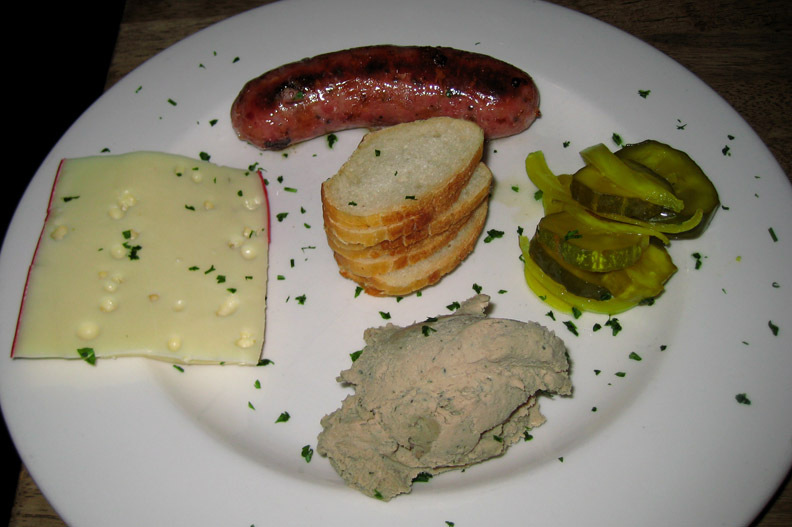 Oh, I'm officially jealous - I love charcuterie plates, and those did sound good. 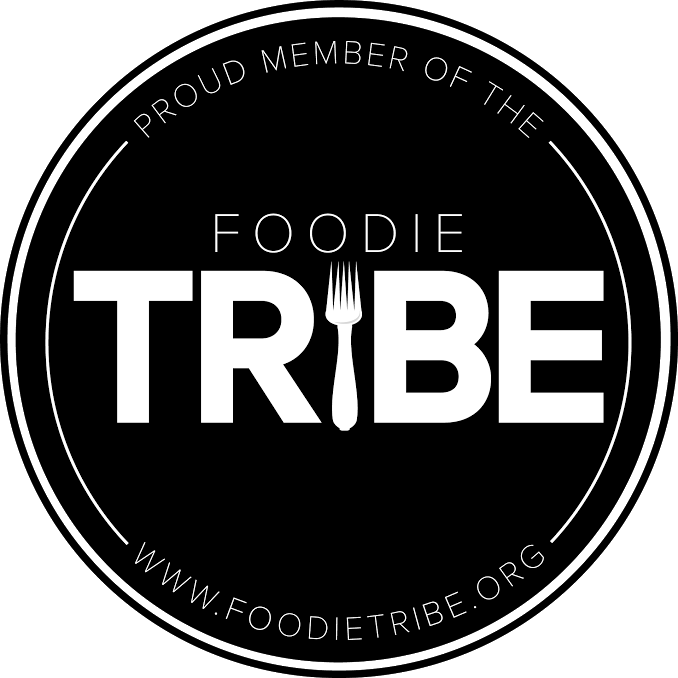 Clicked the link too, and now I want to hear what you say about their breakfasts w/ Korean Hot Pots, house-brined-cured-smoked bacon, not to mention those 'Elvis Waffles'. I've probably been out to eat breakfast in my own hometown maybe 3 times in my life, but Clementine's serves until 2pm on weekends so I might not have any excuse not to try that Korean hot pot!